‘Tis the season for the annual year-in-review column, beloved by writers and editors desperate to fill pages and screens of blank space during these slow news weeks. I’m going to forgo that annual holiday journalism tradition—sort of. While perusing various year-end and year-ahead trend story pitches that had popped into my in-box since Thanksgiving, I came across one from the United States Environmental Protection Agency that caught my attention. The EPA was releasing its annual enforcement stats for 2009. Usually that’s a big yawn, given that for most of the past decade prosecuting polluters was not high on the must-do list of the former administration. 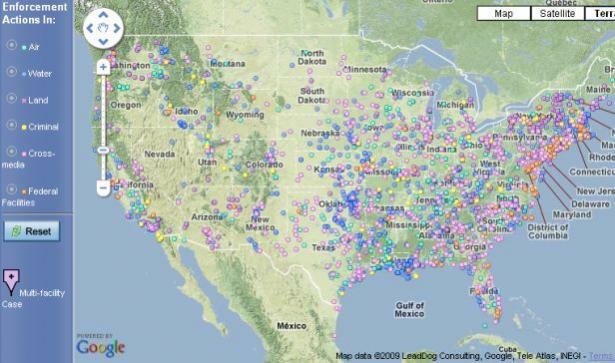 But in 2009 not only was there a much more enforcement-minded EPA administrator in Washington (in the person of Lisa Jackson), the agency for the first time created a Google map mashup of its enforcement actions for the year. The map lets you zoom in on your city, county, or state and see the civil and criminal cases filed by the EPA for violations of its clean air and water laws and other environmental statutes. Click on the air, water, land, and criminal buttons and colored markers start to populate the map showing you the location of various violations. When you click on a marker a link to detailed information about the case pops up. You can also review any past violations.